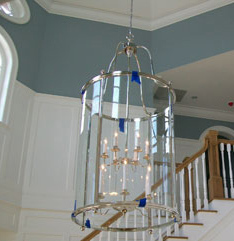 The specialists at Greenwich Metal Finishing can custom-fabricate metal furniture, lighting fixtures, fireplace screens, hardware … whatever you require. We are highly experienced in working with trade professionals – architects, interior designers, lighting designers, and builders – for both residential and commercial applications. Using your shop drawings or measurements we can produce CAD designs for production. In addition to original designs, we can duplicate family heirlooms, treasured pieces, or items from a magazine or catalog. Whether it is a single prototype or a set of identically matched pieces, our complete on-premise services assure you of consistent superior quality along with prompt turnaround. Examples of custom-fabricated pieces that we have produced are displayed in our portfolio. We invite you to talk with us about your custom fabrication needs. Depending on your project, we can meet with you on-site; at our facility in Stamford, Connecticut; or you can email shop drawings.